Do you wonder what’s going on with our county government? Pay raises, elimination of the County Administrator, disbanding the Budget Committee … what’s next? Join Our Community host Candice Michel as she talks with Curry County Commissioner Sue Gold about the state of the County. On October 18, 2018, KCIW hosted a special Candidate Forum in Chetco Community Library. 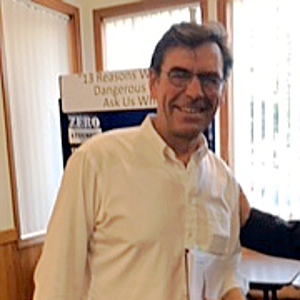 The forum was moderated by Douglas Bunn, Dean of the Curry Campus of Southwestern Oregon Community College. All candidates for the current races of Brookings Mayor, Brookings City Council, and Curry County Commission were invited to attend and to share their ideas and hopes concerning issues that we face in Brookings-Harbor and Curry County. Speaking to a standing-room-only audience, the candidates answered questions written by audience members and read by moderator Doug Bunn. Questions covered a wide range of topics, from local government administration to the protection of our parks and forests. The entire event was recorded by KCIW volunteers, so if you weren’t able to attend in person, you’ll want to listen to this podcast before you vote on November 6. The opinions expressed here are those of the individual participants. Curry Coast Community Radio takes no position on issues discussed in this program. Curry Coast Community Radio does not endorse candidates for elected office. Our students interview Curry County Commissioner candidate Jeri Lynn Thompson. 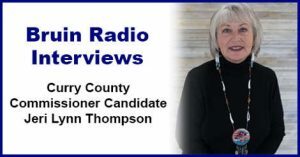 At the time of this episode, Ms. Thompson is one of the four declared candidates for Curry County Commissioner Position 1, currently held by Tom Huxley. Most questions for Ms. Thompson were developed by a group of BHHS students with editing by BHHS Staff. Students reached out to citizen advisors in the community for some questions suggestions and ideas. Ms. Thompson was provided with a list of the questions five days prior to the interview and was given the option to decline to answer questions. Student interviewers asked some impromptu follow-up questions of the guest. 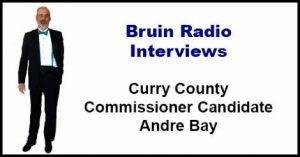 Our students interview Curry County Commissioner candidate Andre Bay. 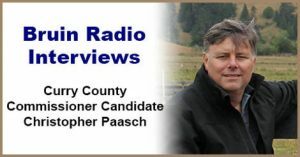 At the time of this episode, Mr. Bay is one of the four declared candidates for Curry County Commissioner Position 1, currently held by Tom Huxley. Questions for Mr. Bay were developed by a group of BHHS students with editing by BHHS Staff. Students reached out to citizen advisors in the community for some questions suggestions and ideas. Mr. Bay was provided with a list of the questions five days prior to the interview and was given the option to decline to answer questions. Mr. Bay did not decline to answer any of our listed questions. At the time of this episode, all four declared candidates for Curry County Commissioner have responded to our requests for an interview and are scheduled. Our students interview Curry County Commissioner candidate Jan Barbas. At the time of this episode, Mr. Barbas is one of the four declared candidates for Curry County Commissioner Position 1, currently held by Tom Huxley. Questions for Mr. Barbas were developed by a group of BHHS students with editing by BHHS Staff. Students reached out to citizen advisors in the community for some questions suggestions and ideas. Mr. Barbas was provided with a list of the questions five days prior to the interview and was given the option to decline to answer questions. Mr. Barbas did not decline to answer any of our listed questions. 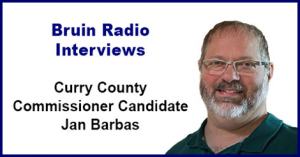 At the time of this episode, three of the four declared candidates for Curry County Commissioner (Including Mr. Barbas) have responded to our requests for an interview. Our guest this week is Mr. Jay Trost. Mr. Trost is the Curry County Juvenile Director, the Curry County Parks Director, a Brookings Parks and Recreation Commissioner, a youth coach, the Chair of the Curry Community Health Board of Directors, and a member of a variety of other local teams and boards. It is apt to describe Mr. Trost as an active public servant, and our Bruin Radio student reporters take the opportunity to ask him some tough questions. He answers each one with confidence and sincerity in this in-depth interview. The music playing in the segment with the robotic voice is a musical composition from freesound.org called technology ambience by user burning-mir, Creative Commons Public Domain license. Pomp and Circumstance, from Wikimedia Commons, is in the public domain. 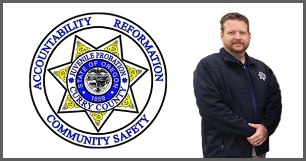 In this edition of Community Conversations, show host Connie Hunter interviews Curry County Commissioner Court Boice about the Chetco Bar Fire recovery effort and the importance of a clear economic vision for the Curry County’s future. This conversation highlights include recognizing the gift behind people coming together in the face of adversity, assessing the negative impact of one-fifth of Curry County being burned, and brainstorming recovery ideas. Click HERE to see an inspiring video “After the Fire is Out” (mentioned in this conversation), shown at a recent Curry County Board of Commissioners meeting. Skip forward to 2:05:25 to see “After the Fire is Out”. Music is Never Ending Optimism, licensed from audioblocks.com. 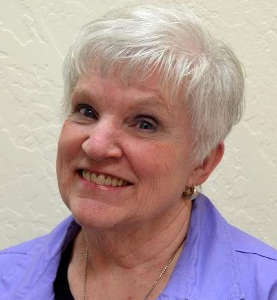 In honor of April being National Volunteer Month, Curry County Commissioner and community volunteer Susan Brown joins Community Conversations show host Connie Hunter to talk about volunteerism and to encourage county residents to become community volunteers. 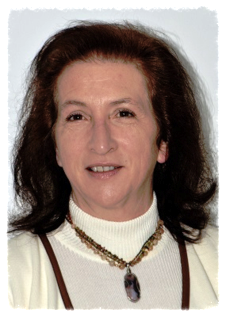 Learn about how volunteers make a huge difference in our local county government. Find out about volunteer opportunities in Curry County government and at local nonprofits. And don’t miss Commissioner Brown’s story about volunteering to be “mock” arrested and put in a “dunk tank” for charity. Volunteering can be fun, too! Community Conversations celebrates volunteers and volunteerism, not only in April, but throughout the year, with the introduction of this new series – Volunteers Make the World Go ‘Round! Many thanks to Commissioner Brown for helping KCIW podcasts reach 10,000 downloads! What’s Curry County’s greatest asset? According to Curry County Commissioner Susan Brown the answer to that question is easy. The citizens of Curry County are the innovators, community builders, and strategic planners whose many gifts will craft the future success of Curry County. This installment of KCIW’s Community Conversations provides an in-depth report and update on Curry County’s Community Outreach Forums with Commissioner Brown. The forums consist of a three-part series of 15 meetings held at locations across the County. As part of the ongoing mission to provide factual and nonpolitical information for citizens, show host Connie Hunter and Commissioner Brown work together to make sure that the citizens of Curry County have one more avenue for citizen involvement and civic engagement. Brown provides important County information and highlights the County’s efforts to initiate a call to action for the citizens of Curry County. Beginning with a “state of” Curry County report, Brown discusses recent survey results, provides a civics lesson regarding the county’s budget, and explains “the money-in and money-out” relationship with the 45 districts that provide services for Curry County citizens. Brown also discusses how part two of Curry County’s Outreach Forums provides a simple format for county-wide “brain storming.” Brown asks citizens to share their ideas for increasing our County’s income/revenue and for suggestions for county priorities as input to a Curry County strategic plan. Beyond recruiting businesses to come to Curry County, citizens’ suggestions include everything from a sales tax, gas tax, and transient lodging tax, to event fees and even revenue from a toll bridge. Join in the conversation that is kicking off the new smart growth strategies for Curry County economic development. Show host Connie Hunter embraces Brown’s core values supporting a safe culture of civic engagement and citizen involvement. This is the beginning of a brighter future for Curry County – and, this conversation is filled with hope and direction.